Every Black Hole Contains Another Universe? And our universe may sit in another universe's black hole, equations predict. Like part of a cosmic Russian doll, our universe may be nested inside a black hole that is itself part of a larger universe. In turn, all the black holes found so far in our universe—from the microscopic to the super-massive may be doorways into alternate realities. In a recent paper published in the journal Physics Letters B, Indiana University physicist Nikodem Poplawski presents new mathematical models of the spiraling motion of matter falling into a black hole. His equations suggest such wormholes are viable alternatives to the "space-time singularities" that Albert Einstein predicted to be at the centers of black holes. According to Einstein's equations for general relativity, singularities are created whenever matter in a given region gets too dense, as would happen at the ultradense heart of a black hole. Einstein's theory suggests singularities take up no space, are infinitely dense, and are infinitely hot—a concept supported by numerous lines of indirect evidence but still so outlandish that many scientists find it hard to accept. The notion of black holes as wormholes could explain certain mysteries in modern cosmology, Poplawski said. For example, the big bang theory says the universe started as a singularity. But scientists have no satisfying explanation for how such a singularity might have formed in the first place. 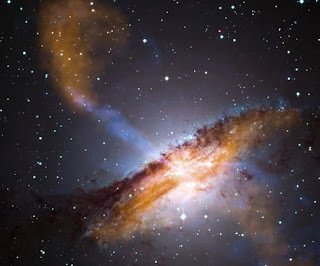 If our universe was birthed by a white hole instead of a singularity, Poplawski said, "it would solve this problem of black hole singularities and also the big bang singularity." The universe therefore appears flat, because the sphere we're sitting on is extremely large from our viewpoint - just as the sphere of Earth seems flat to someone standing in a field. Inflation also explains how objects so far away from each other might have once been close enough to interact. But assuming inflation is real astronomers have always been at pains to explain what caused it. That's where the new wormhole theory comes in. According to Poplawski, some theories of inflation say the event was caused by "exotic matter," a theoretical substance that differs from normal matter, in part because it is repelled rather than attracted by gravity. Based on his equations, Poplawski thinks such exotic matter might have been created when some of the first massive stars collapsed and became wormholes. The new model isn't the first to propose that other universes exist inside black holes. Damien Easson, a theoretical physicist at Arizona State University, has made the speculation in previous studies. "What is new here is an actual wormhole solution in general relativity that acts as the passage from the exterior black hole to the new interior universe," said Easson, who was not involved in the new study. "In our paper, we just speculated that such a solution could exist, but Poplawski has found an actual solution," said Easson, referring to Poplawski's equations. (Related: "Universe 20 Million Years Older Than Thought.") Nevertheless, the idea is still very speculative, Easson said in an email. "Is the idea possible? Yes. Is the scenario likely? I have no idea. But it is certainly an interesting possibility." Future work in quantum gravity—the study of gravity at the subatomic level—could refine the equations and potentially support or disprove Poplawski's theory, Easson said. "There're really some pressing problems we're trying to solve, and it's not clear that any of this is offering a way forward with that," he said. Still, Albrecht doesn't find the idea of universe-bridging wormholes any stranger than the idea of black hole singularities, and he cautions against dismissing the new theory just because it sounds a little out there. "Everything people ask in this business is pretty weird," he said. "You can't say the less weird [idea] is going to win, because that's not the way it's been, by any means."